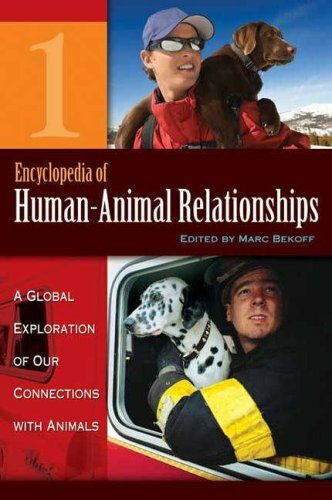 Encyclopedia Of Human-Animal Relationships (4 Vol Set): 9780313334870 Hardcover - LIMEROCK BOOKS INC. Humans and animals live together on earth, but as we increasingly reshape ecosystems to accommodate larger populations, technology, and increased consumption, animals are greatly affected. The history of civilization shows that humans have used animals for food, clothing, transportation, making a living, and even companionship, as well as subjects for the arts, literature, and within religious beliefs. Renowned animal behaviorist Marc Bekoff and 300 experts from around the globe provide more than 350 essays that discuss such topics as animals and ecology; animals and global warming; animals as food; animals as pets; animals and diseases; animals in research and in education; animals providing assistance; and the influence of animals in art, religion and philosophy, literature, music, dance, and entertainment. Students and all those wanting a better understanding of the reciprocal connections and interdependence of organisms on the planet will benefit from this fascinating and instructive reference work. Bekoff and contributors ranging from scientists and researchers in other disciplines to teachers, writers, and artists along with those who work with animals in service, rescue, and training have provided engaging and thought-provoking entries ranging in length from 500 to more than 5,000 words. Each entry in the encyclopedia ends with recommended further resources, which may include books, articles, Web sites, and videos. The volumes are illustrated with photographs, drawings, charts, and tables. An extensive bibliography, comprehensive index, and classified lists of entries provide extensive access to the contents of the encyclopedia.